At Keywee, we’re lucky enough to work with hundreds of the world’s top storytellers every day. Together, we leverage their strongest asset — content — to meet their business goals in the most efficient way possible. This often means reaching existing and potential readers on paid distribution channels, like Facebook. 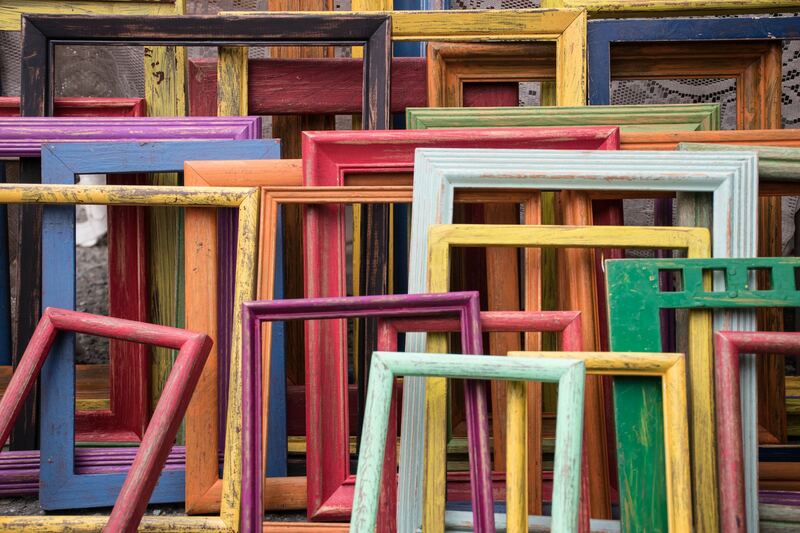 In the world of paid content distribution, small creative changes can make a big impact on ROI. We always suggest each storyteller test multiple creatives per story and change creatives frequently, keeping creative best practices in mind. 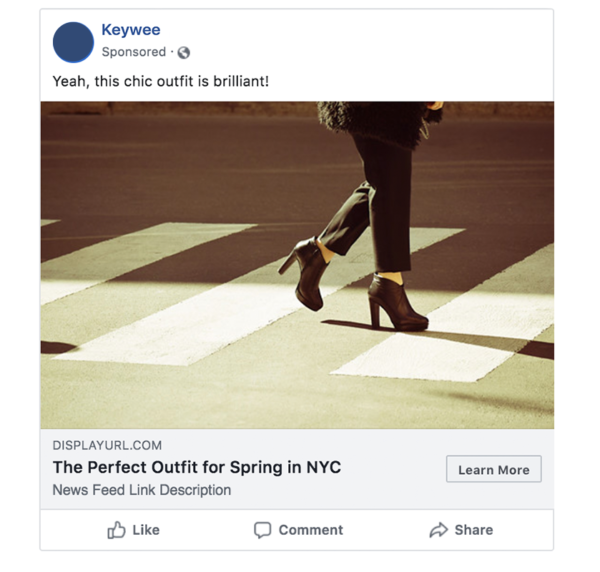 And while many people are well versed in best practices for the Facebook News Feed (which you can read more about here and here), real creative optimization requires attention to the audience you’re targeting as well. To help introduce audience-specific best practices, our team ran over 100 models on Facebook performance data to understand factors that impact Facebook CTR for different groups. Here are some of our findings. In general, our data showed that females were more likely to click on content than males were. Interestingly, this was true not just on average, but in every single age bracket. Of course, certain content will naturally perform better with males, but in general, you can expect to see better engagement from females. While females may click more on average, it usually doesn’t make much sense to exclude half of the population from your targeting. 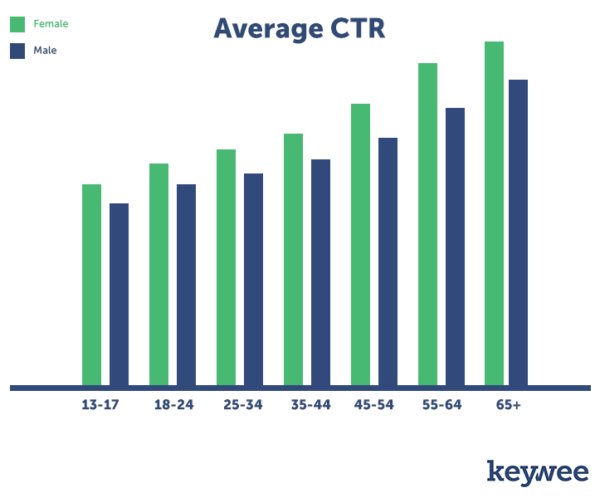 We wanted to dig deeper into the second trend we noticed – the way age affects CTRs. It turns out, looking at the entire population of Facebook users, older people click more. 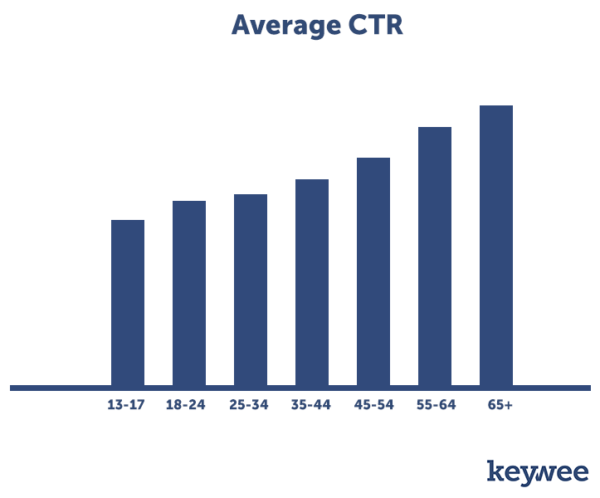 We saw CTRs monotonically increasing by age, with the group of people 65 and older clicking the most. However, perhaps more interestingly, we found that different words and phrases engaged different age groups better. So while older audiences will tend to click more, many posts will perform better with younger audiences. For example, posts with the word “stunned,” performed better with older audiences whereas posts with the word “embarrassing” saw much higher engagement from younger audiences (specifically those between the ages of 18 and 34). There is some overlap between the phrases that perform well in each age group. We found that the correlation between groups is highest between an age group and the one directly above or below it. In other words, the closer in age two people are, the more likely they are to react well to the same words. This is a useful finding that allows us to combine audiences to create bigger data sets or targeting parameters. However beware: the 13-17 age group is the most different from all other age groups. Their average correlation with other groups is about 0.35 while all other group correlations are about 0.55 on average. This means you may want to keep them separate in your audience targeting. 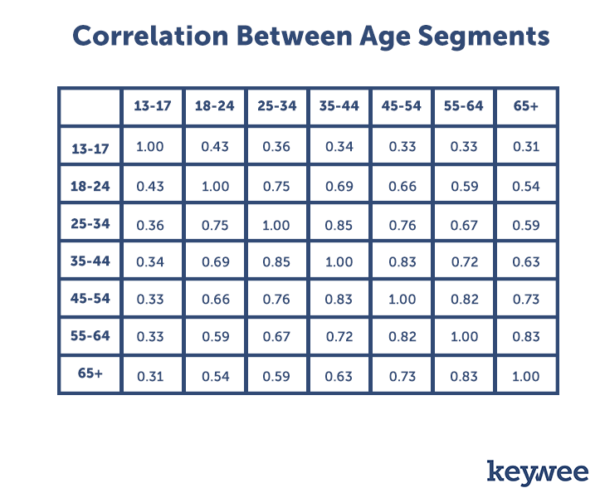 The following chart shows the correlations between each age group. Notice that the numbers get lower the further away you get from the original age group. These were all interesting examples, but we wanted to see how these types of insights could affect creatives strategy. To do so, we created slightly different versions of the same post targeted at very different age groups. This post is targeted at older Facebook users. 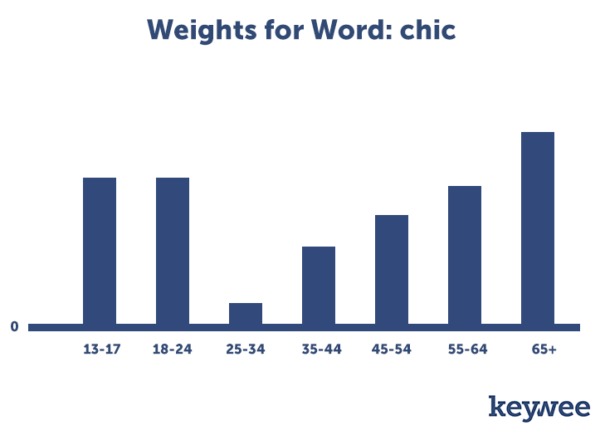 The word glamorous performs very well with people 45+ (3 age groups), but is much less successful for the younger age groups. 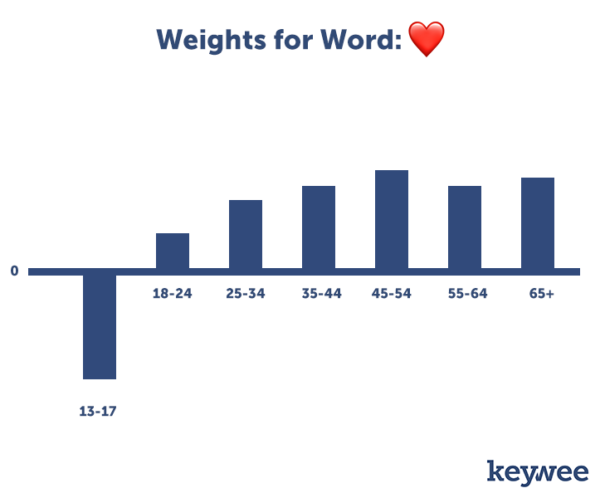 Similarly, heart emojis are very engaging to the older age groups while actually causing a negative response for the youngest group of Facebook users. For a younger audience, we would take a different approach to the post. 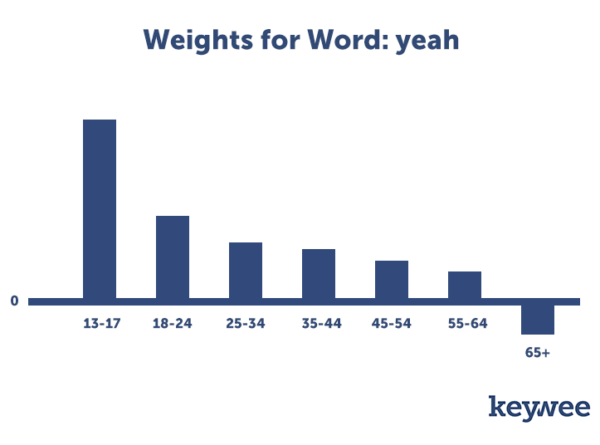 The word “Yeah” performs well with users between 13-24, but not with older audiences. “Brilliant” has a strong positive effect with younger age groups as compared to its synonyms. For example, “excellent” has a negative engagement impact on these groups. Chic is an interesting word choice. It’s quite popular with audiences younger than 25, but also “makes a comeback,” driving a huge CTR impact for users above the age of 55 as well. While we used it in our post geared toward younger audiences, it has the potential to perform well in other posts too. While these are great insights into particular words that can boost CTR, the most important takeaway here is the value of segmentation and testing. Some words may perform very well with some audiences and actually decrease CTR for others. For this reason, we always recommend that our storytelling partners test out a variety of creatives and audiences before scaling their campaigns. 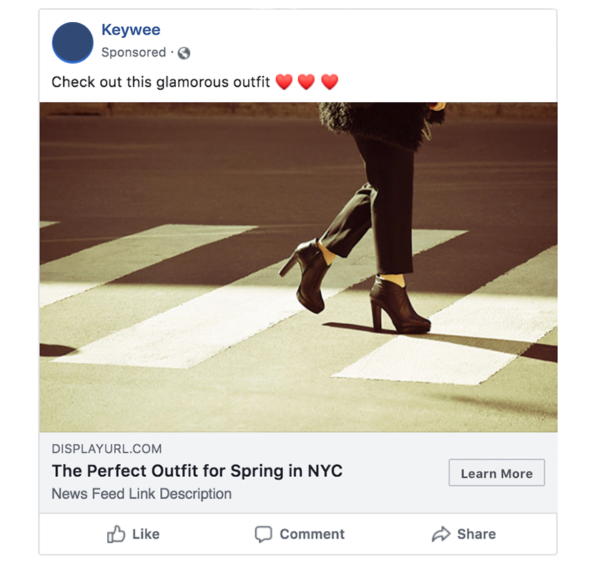 Keywee’s platform leverages machine learning models and a vast database of Facebook performance to predict the tweaks that will have the biggest impact on performance. If you’d like some AI-powered assistance optimizing your creatives and campaigns, get in touch. We’d be happy to help.